Section 179 expensing is valuable because it allows businesses to deduct up to 100% of the cost of qualifying assets in Year 1 instead of depreciating the cost over a number of years. Section 179 expensing can be used for assets such as equipment, furniture, and software. Beginning in 2018, the TCJA expanded the list of qualifying assets to include qualified improvement property, certain property used primarily to furnish lodging, and the following improvements to nonresidential real property: roofs, HVAC equipment, fire protection and alarm systems, and security systems. The maximum Section 179 deduction for 2018 is $1 million, up from $510,000 for 2017. The deduction begins to phase out dollar-for-dollar for 2018 when total asset acquisitions for the tax year exceed $2.5 million, up from $2.03 million for 2017. For qualified assets that your business places in service in 2018, the TCJA allows you to claim 100% first-year bonus depreciation…compared to 50% in 2017. This break is available when buying computer systems, software, machinery, equipment, and office furniture. The TCJA has expanded eligible assets to include used assets; previously, only new assets were eligible. Keep in mind that Section 179 expensing and bonus depreciation can also be used for business vehicles. So purchasing vehicles before year end could reduce your 2018 tax liability. But, depending on the type of vehicle, additional limits may apply. 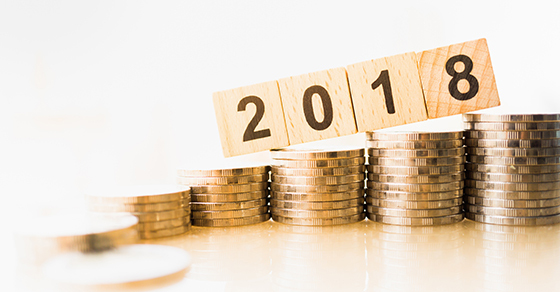 Investing in business assets is a traditional and powerful year-end tax planning strategy, and it might make even more sense in 2018 because of the TCJA enhancements to Section 179 expensing and bonus depreciation. If you have questions about these breaks or other ways to maximize your depreciation deductions, please contact us.